NOTE: EVENT IS SOLD OUT! To be put on a waiting list, email us. Ventura, CA — December 9, 2008 — The annual New Year’s event at the Ventura Improv Company (VIC) on December 31 promises to be a magical night of music, food, prizes and fun, says Tom Mueller, Director of the VIC, located in Ventura’s historic downtown district. The festivities run from 7:00 until 10:30 pm at the VIC. Guests will sample the delicious hors d’oeuvre and dessert buffets while they peruse the silent auction, which features a wide variety of items donated by local businesses. The guests will then be treated to a comedy improv show by the award-winning VIC performers. A champagne toast and more revelry follow the performance. This event almost always draws a sell-out crowd. Part of its appeal is the early starting and ending time, making a family-friendly atmosphere. “With the event ending at 10:30, our guests can move on to another party to celebrate the new year, or call it a night — and beat the crowds home,” says Gary Best, VIC’s Associate Artistic Director. Tickets are $25/person, and $15 for ages 16 and under. Please note: No other discounts or complimentary tickets can be honored for this special show. Gift certificates may be used for the cost of full-price tickets. New! Use our online reservation system to reserve your tickets and seats today! Caption: Chris James leads the festivities at last year’s New Year’s Eve Bash at the Ventura Improv Company. Note: Please contact the VIC if you need high-resolution photos or additional information. In 1989, an improviser from the Bay Area TheatreSports™ group came to visit her mother in Santa Paula and while there she put on an improv workshop. At that time, there were a handful of performers doing improv in Ventura, and several of them, including current leaders of the group, Gary Best and Tom Mueller, attended that workshop. 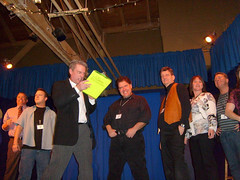 The two considered that workshop “a revelation,” and went on to form a local TheatreSports™ league. In the two decades since then, the group has grown in both size and scope and recently created an exciting new vision and strategic plan that they hope will accelerate the growth of their current audience and the scope of their future offerings.